QRP means "low power operations." Usually, 5W CW (Morse Code), or 10W SSB (voice). Think of a 10W light bulb and how far it lights up your back yard at night... Not very far. A 5W CW signal though can cut through the ether like a divorce through your bank account. If 5W works fine, then wouldn't 100W work better? Sure, but there is no free lunch. Many preppers think that they will be able to stay home and ride TEOTWAWKI until the cows come home. If you live in a heavily guarded compound with lots of armed defenders, food and ammo, you might. But who does? There is a good chance that you may have to relocate a few times, or have to travel some distance to get food or other goods, reunite with family members (from whom you heard on the radio of course) and so on. Is that old 40Lbs tube-powered boat anchor going to help you? Most QRP rigs can run forever on batteries so small, you can carry them in your pocket. They can be recharged from a flexible solar panel hung on your backpack. Sure, you might only run 5-10W, or even 1W, but after a few miles of walking, I can guarantee you that you will be throwing things away right and left, including that car battery you hoped to use to power your big Yaesu. 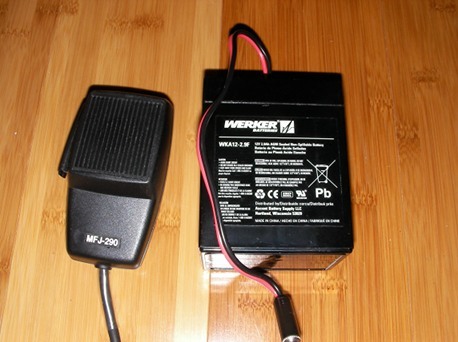 Even mobile transceivers producing more than a few watts will require quite a power supply. Some allow to set their output power much lower, and that is great. You still need to look at receiver current draw. My Elecraft K1 draws 55mA on receive! A K2 draws 150mA, a Yaesu FT-817ND draws 450mA... Some radios draw much more. How heavy a battery are you willing to carry? I use the 2.9Ah model shown below, which is the maximum weight I am willing to carry for that purpose. Then you have the matter of the antenna. You can't carry a disassembled vertical with you. For HF, you will need a substantial antenna, especially with low power. I find the end-fed dipole to be perfect. You can find the impedance matching boxes here: http://earchi.org/proj_homebrew.html. I made one, and it works great with a 35.5ft wire for 40 to 15m. Some models are single-band, without requiring a tuner. I plan on making more, you guys let me know if you want one. I get copper-cald steel wire (#532) from http://thewireman.com/antennap.html. I really don't want to carry any more than necessary. A trip started in decent conditions, given the circumstances, can quickly turn into hell in a New York minute. Even if you have a car, that might not last the whole way. Without rule of law, anything is possible. If you end-up on foot, make sure you can carry your gear at a fast pace for a while. Which brings me to another subject to explore in a future article: Are you in decent shape physically? Do you spend too much time on your favorite chair enjoying QSOs in you Ham shack, eating blueberry muffins? (I'm dying for one right now!). You can't prepare selectively. It might upset you to hear this, but unless you have valid medical reasons not to diet and exercise (one doesn't work without the other), you are fooling yourself. Here is my first attempt at a "go-kit." I have a bug-out bag mind you, which is always a work in progress, that is another story. You are looking at an Elecraft K1, the above battery, a paddle mounted on a Rock-Mite 40 mini transceiver, and a wire antenna. Yes, there are two radios in that Pelican 1400 waterproof case. Even that I think is a tad too big. I plan on making a second kit with an SSB radio. Note that I always keep them in a grounded metal box for EMP protection. I believe that when things really go bad, QRP is the way to go, for mobility reasons. 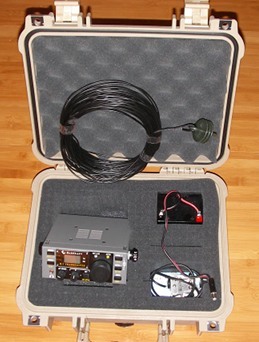 It is also easier to hide a QRP transmitter. Take the Rock-Mite for instance, you could keep one in your jeans back pocket. Small 2m handhelds take little space. They are also in essence QRP rigs. Remember that you might be carrying your bug-out bag.. I have thought of buying a cart, just in case, but that would draw a lot of unwanted attention. "When All Else Fails," right? You need to prepare for that. Most hams or preppers do not. Cost is also a major consideration, for me at least. There are quite a few other items I need to acquired before considering myself "ready." I am pretty far from it right now. In the meantime, the world seems to be going in the wrong direction at a rapid pace. So, the least I spend, still maintaining some standards, the faster I get ready. Buying small and light equipment is often more expensive (i.e. camping gear! ), but fortunately that does not apply to radios. Look at the MFJ-94xx series for instance, they sell new for around $250, and you can occasionally find them for much less on Ebay. Much of the other stuff on Ebay is too heavy, but sometimes you stumble on a gem. I often search for "QRP," just in case. CW radios are the cheapest. A Rock-Mite mounted in an Altoids box might set you back $40, and will give you a nice minty breath! A Webber Tri-Bander kit costs $200 and outputs 5W. Ten-Tec sells a Chinese made CW transceiver for $249 (40/20m). A K1, the Ferrari of CW rigs, will set you back $300 to $530 (4-bands & auto tuner), and 30 hours of work. A Yaesu FT-817ND: $670. There is something for everyone. As far as bands go, I am strongly leaning towards 40m, for CW and SSB. Why 40? Because it works most of the time, even during low solar activity. It works for long distance contacts as well as regional ones. A basic Technician license holder can use some of the CW portion of the band. The General license doesn't seem hard to get. I am already passing most of my practice tests on http://qrz.com, and I read the book once. I'll go for both tests once I get my Morse Code up to speed. I know it isn't required, but since I want to operate mostly HF and CW, I am in no hurry. Honestly, the stuff I hear on 2m is pretty boring. My Yaesu Ft-270R handheld lives in a tin box in my closet somewhere, and I never take it out. I think the first Radio Preppers Net might end-up being on 40m... More on that in the near future. I thought about CB, but a Ham license is too cheap and easy not to get. Also, CB contacts are supposed to be with 250km, which isn't much. Nobody pays attention to that it seems, but why not respect regulations if there is no emergency..
Go QRP! If you can do it with 5-10W, then you can do anything. Gil, your Elecraft K1 is sweet-- technically and aesthetically. You will be able to work the world with it on either CW or SSB. As you have learned by now, it is all about the antenna, the location, and the operator skill. Good luck with it. There are hams who have worked the world on <100 mW. So you have a pile of decibels in that K1 over that. Thanks, that K1 is CW only, but I might get an MFJ 9440 for SSB! Not sure if and when I will be able to read a post like this and understand- I mean really understand. This pattern of using ancroymns that make little direct sense is starting to grind on my nerve. For example: QRP means "low power operations." Why not use LPO to indicate low power operations? Maybe I am too simple minded. BTW, Great post. It will make a helpful marker to any progress I might make. Why not "LPO"? Well, LPO would maybe be ok for those who spoke English. Think in broader terms; it could be argued that the majority of the world's radio amateurs do not have English as their first language. So, in part because of that, we started using Q-signals back in the beginning of the century before this one, so as to be able to more readily communicate with our friends in the USSR, Japan, and little tiny islands that most people don't even know exist. Even today, if I send "QRP?" to a new-found friend in Bangkok, he'll know exactly what I mean. I was a Thai linguist at NSA but I wouldn't dream of trying to use Thai to communicate with him. QRP, he knows. Now if you REALLY wanna get somebody mad on CW, ask him "QLF?" Then you have the matter of the antenna. You can't carry a disassembled vertical with you. I thought I remember you mentioning having a Buddiestick ! Mine is all homebrew but works the same and uses a much longer whip for more efficiency. The base section was an old shotgun cleaning rod I bought at a fleamarket. Its 4 aluminum sections, 2/3" diameter that screws together and I threaded the ends 3/3" x 24 thread to fit my coil and mount. Works like gangbusters, but wire is much lighter ! Well, the great thing about the Buddistick or similar antennas is that you don't need a tree... The downside of course is that not much power gets radiated. For CW, no problem, people make contact using dummy loads sometimes but for SSB, it makes things a bit harder. I just put up an MFJ Feather-lite 40-6 meter vertical antenna.....2980...........it telescopes from 3 3/4 feet to 31 feet.........weighs 3.3 lbs..............have it on a stand which puts it up to 35 feet.......seems to work just fine. This antenna gets bad reviews because of wind damage.........we put it up in a 25 mph+ wind and all it did was wave a little. This antenna and my 857D will go with me if I have to leave home base.